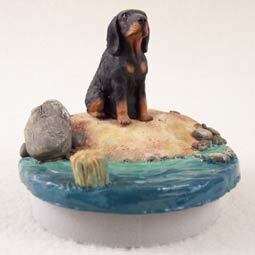 Coonhound Black & Tan Candle Topper Tiny One "A Day on the Beach"
Home > Dogs All > Coonhound Black Tan > Coonhound Black & Tan Candle Topper Tiny One "A Day on the Beach"
The Black and Tan Coonhound was named, simply, with his color and purpose. With their coal black short coat, with tan markings, its instinct is to track and tree raccoons, or any small game, however, the breed can also be used to hunt larger game as well. A true American breed, the Black and Tan Coonhound’s ears are to be longer than the length of his nose and remain one of his most notable features. Recognized by the AKC in 1945, the Black and Tan Coonhound ranges in size from 23 to 27 inches tall at the withers.